You don’t have to avoid the water just because you’re wearing a cast or bandage. Simply apply one of our SEAL-TIGHT® waterproof cast and bandage coverings—the easy way to keep water out while you shower, take a bath or play. To help you maintain a dry cast without worry, SEAL-TIGHT styles fit anyone in your family. They’re the easy way to cover cast and bandage wearers of all ages with extra protection during a shower or bath. A SEAL-TIGHT cast protector keeps you dry Don’t fumble with plastic bags and tape to make a cast waterproof — use SEAL-TIGHT coverings instead. The key is the SEAL-TIGHT watertight seal – a flex-seal rubber diaphragm that slips easily over the cast and fits your leg or arm squeegee-tight. Doctors in the know recommend SEAL-TIGHT from past experience. They’ve used a SEAL-TIGHT to waterproof a cast or bandage to keep their patients dry, time and again. Doctors know that dressings and other healing aids stay dry with SEAL-TIGHT, too. Why it’s important to waterproof casts to keep them dry Most casts are easily damaged by water, which reduces their rigidity and requires costly replacement. SEAL-TIGHT saves time and medical costs with its latex-free cast cover that’s easy to get on and easy to get off. Instead of dealing with a wet, soggy cast, you can resume your normal daily activities fast with SEAL-TIGHT —the perfect waterproof cast cover that keeps casts dry. They’re perfect for the shower—perfect for your bath. Keep your cast dry and clean to improve hygiene With a SEAL-TIGHT bandage or cast cover, your skin stays clean and dry. Protected beneath a dry cast or bandage, the skin is far less susceptible to infection, and your body can continue the healing process uninterrupted. 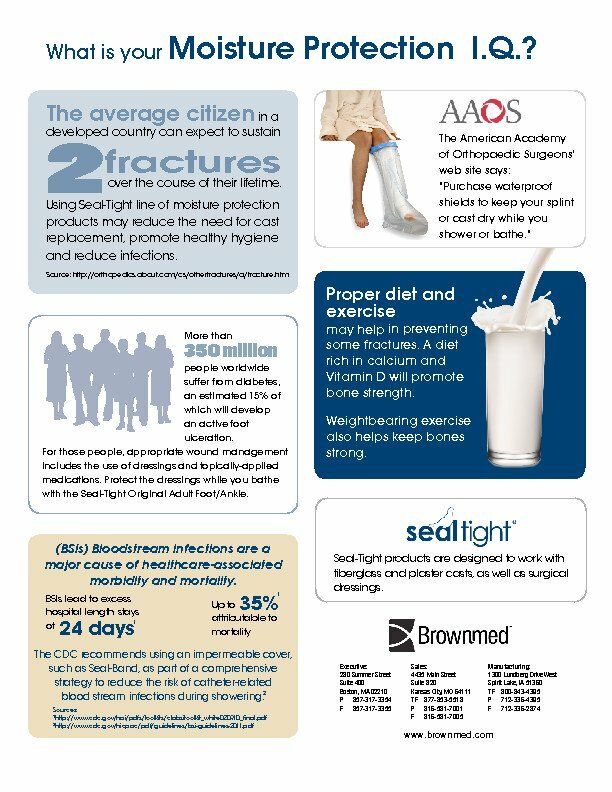 Don’t settle for a wet cast or soggy bandage The American Academy of Orthopedic Surgeons’ Web site recommends the purchase of waterproof shields to keep your cast or splint dry while you shower or take a bath. SEAL-TIGHT is the superior, economical, waterproof solution. So turn to the market leader – select from our full lineup of models and sizes now, to keep your cast dry, waterproof your bandages and enjoy the water once again!